It’s almost time for Thanksgiving and for many that means family, football, and a big meal. If you’re like me, you’ll end up overindulging and feeling stuffed. In fact, sometimes people become stuffed on stuffing. 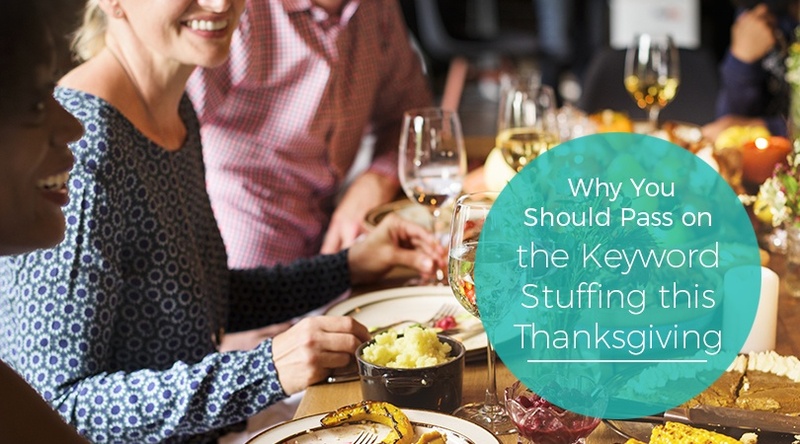 Now if you’re trying to grow your business, you’ll want to make sure “stuffed on stuffing” is the only type of stuffing you get into. What am I talk about? Keyword stuffing. Keyword stuffing is an old SEO trick used by spammers. The goal of keyword stuffing is to jam or “stuff” as many keywords onto a page as possible. In some cases, this would result in a page only containing a keyword over and over with nothing else. A more common example of keyword stuffing would be a blog that contains the keyword used an unnatural amount of times with little useful information. Why would anyone want to do that? Well, if you are a site visitor you probably never want anyone to do that. Sites that feature only keywords are rarely of any use to a visitor. However, for a spammer, this trick was a good way to get more site views and increase ad revenue. You might be saying to yourself, “but keywords are important, they drive traffic, why wouldn’t I keyword stuff?” There is a difference between keyword stuffing and following smart SEO practices. Yes, it is true you need to write your blogs around central keywords but think of things this way: You want to write good content that people will enjoy reading. To do this, you follow smart SEO practices to ensure people will find your content. When you fill your content with an overabundance of keywords, you will end up losing the good content you originally intended for people to read. It was an awful trick to play on people that were surfing the web, but thankfully Google and the other search engines caught on. The result of Google wising up to this means that pages that do this can be punished and will start to appear lower and lower on the SERP. This doesn’t mean that you won’t see a short-term benefit from keyword stuffing but the long-term impact on your site significantly outweighs it. Did any of this help or did I just make you paranoid? Trust me; I get it. Heck, I was afraid that using “keyword stuffing” in the last H3 was too much. Oh no! I said it again. Let’s be real, it can be intimidating, but I’m going to tell you something that any trustworthy marketer will tell you; all you need to worry about is writing content that you are proud of and that people will want to read. Yes, sure you need to include your keywords but don’t stress about it. Instead, spend your time focusing on creating great content. So, this Thanksgiving feel free to ask for seconds of stuffing and whatever you do make sure you avoid keyword stuffing. Additionally, if these concepts and the pressure of running your marketing is starting to make you feel like you are in over your head, feel free to contact us. There is no pressure. Maybe we will talk about your marketing needs, or maybe we will discuss how much turkey we both ate. The choice is up to you.